Earn $6.12 in Rewards credit (612 points) What's This? 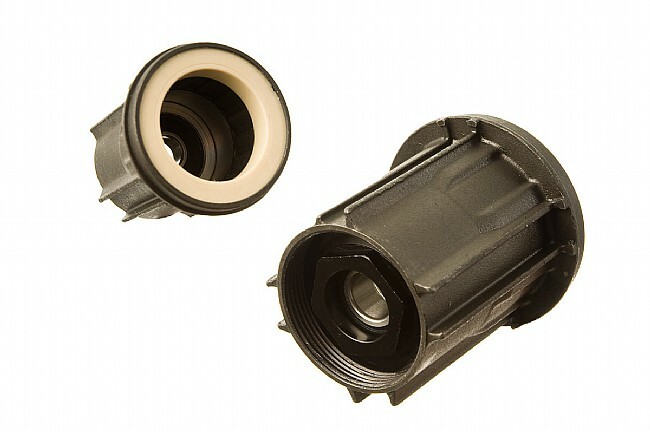 The FTSL Freehub body is compatible with all Mavic road wheels from 2002 to present. Campagnolo 9/10/11 compatible splines or Shimano 9/10/11 compatible splines. Easy to install, wheel spins like new! I bought a new Freehub Body when I started hearing a weird clicking noise coming from my 2009 Mavic Ksyrium Elite wheels. The plastic bushing was worn from age. Ordered this hub body replacement instead of trying to replace just the bushing, as I didn't want to risk damaging the splines inside the old hub body. The install was easy and my 2009 wheel feels like new! Easy install - great price - works like it should! Simple conversion needed from Shimano hub to 11 speed Campy. Installed and use on Mavic 40C wheel. Price was significantly less than LBS and ALL other online bike shops and eBay. Install took all of 8 minutes. My freehub was making a very loud noise on descents when freewheeling. Seems when the bearing surface wears down it can cause this problem. Tried cleaning it first, but the noise came back. This new hub fixed the issue! The hub does what it's suppose to do but I also have found the nylon bushing to be a slight issue. Besides using mineral oil I've used a small amount of Phil Wood grease on the bushing . Seems to prolong the life of the hub. When the bushing wore down a little I'd get a little play in the cassette and it would make a little knock , knock noise when cranking but the grease took care of it . Good old Mavic FH Body, if U keep it clean it will last a long time. All I've ever ridden on for years. With proper maintenance they last a long time. Won't use anything else. I love that Mavic continues to use steel for their cassette carrier, I wish they would just change to a standard bearing instead of the plastic ring that interfaces the hub. There is just to much drag with this set up and wears quickly. Cheaper than replacing the whole wheel! After 50,000 kms the nylon bushing had enough wear to make the cassette on the hub unstable. Once replaced the freehub body was nice and tight on the hub...like new. Great deal at 70 dollars. One of the easiest switches from Campy to SRAM I've ever done ! 3 of 5 customers found this review helpful. I had never worked on a Mavic wheel, never really had the need to. One of the most simplest swap outs I've done in years. Comparing bottom bracket types and standards. You wanna go fast? Join the ceramic revolution! Make your upgrades count. Here's the equipment that will help you ride your bike faster. Campagnolo vs. Shimano vs. SRAM: demystifying groupsets. What to consider when selecting a crankset for your road bike.